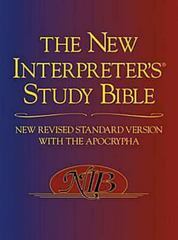 The New Interpreter's Study Bible 0 Edition The New Interpreter's Study Bible brings the best of biblical scholarship to the service of the Church. In this new edition based on The New Revised Standard Version of the Bible with Apocrypha, sixty distinguished scholars have provided background and insight on the biblical text. Features include extensive historical and theological annotations on the biblical text; brief introductions and outlines for each biblical book; excursuses giving further background and insight regarding particular themes and passages; and nineteen commissioned maps detailing the biblical world at various historical periods.